In almost any American city, one learns very quickly that there are places you do not go. There are streets you do not cross, neighborhoods you do not enter. When we lived in New Orleans in the eighties, we knew that when in the French Quarter, you did not cross Rampart Street. That was a boundary you did not bridge. 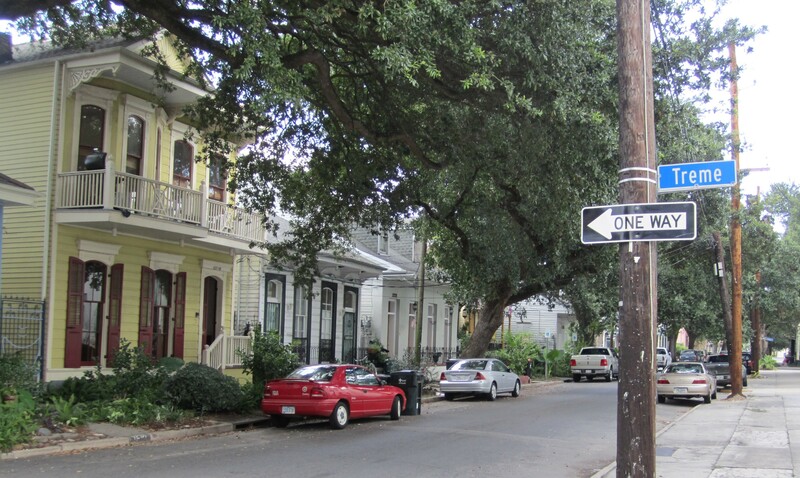 It was not until the HBO series of last year that I learned that the area across Rampart Street is called Treme. And it is really now not so dangerous at all. I was with Tootie for the weekend in New Orleans. My friends Lyman and Steve were also there. That morning we were meeting Lyman and Steve for brunch. I only had a little less than two hours by rental bike. Even at nine A.M., it was already very hot. 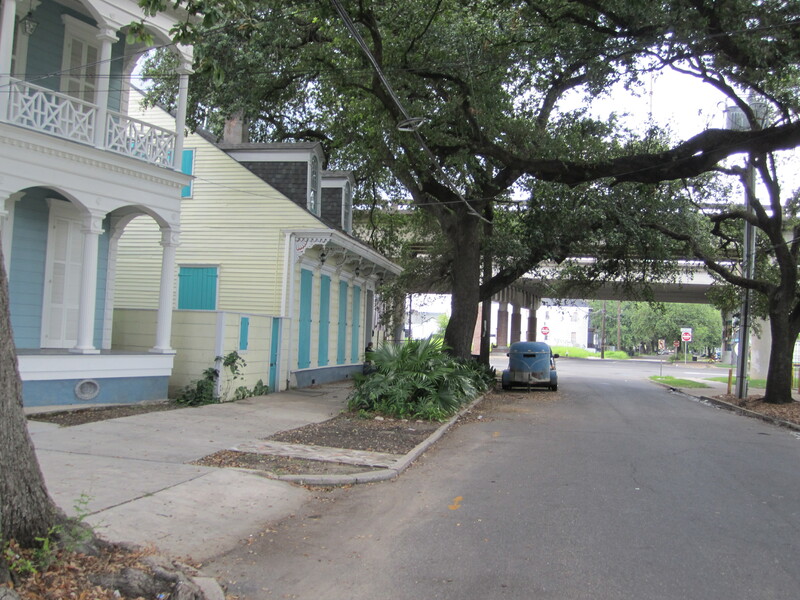 Parts of Treme were devestated in the sixties when the oak trees of the Claiborne Avenue neutral ground were cut down and I-10 was put as an elevated expressway down the middle. This came after routes through whiter neighborhoods were rejected. There has been talk now of tearing down this freeway, which, or course, also costs more money. Riding further out Esplanade Avenue from Treme, after crossing Broad Street, you pass into an area of Mid-City called Esplanade Ridge. You are reminded of the stunning beauty of miles and miles of New Orleans. When I first came here in 1976 I was stunned at the beauty and it still takes my breath away. I rode through this part of Mid-City and turned down Canal Street for the ride back to the hotel in the French Quarter. 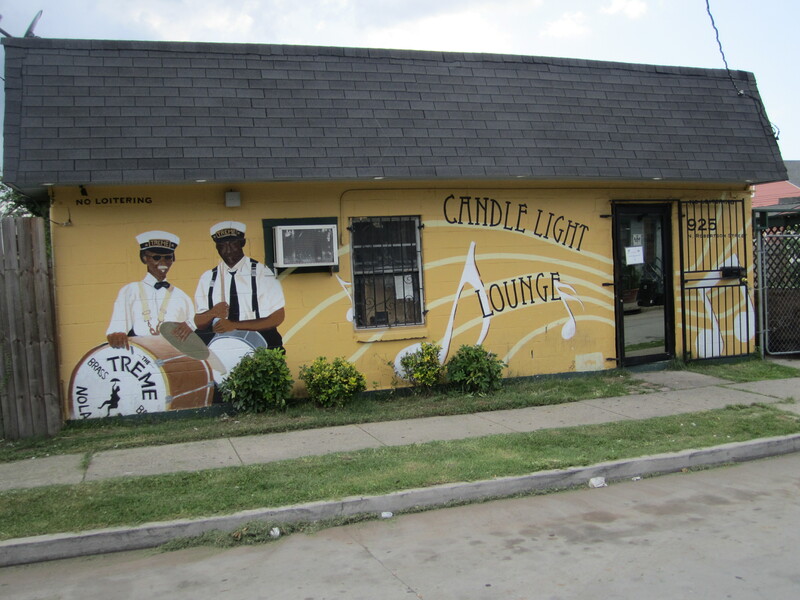 On a previous trip, Tootie and I had taken an architectural tour of Canal Street in Mid-City, showing us the surprising number of quality mid-twentieth century buildings in the area. Many were abandoned or in disuse. 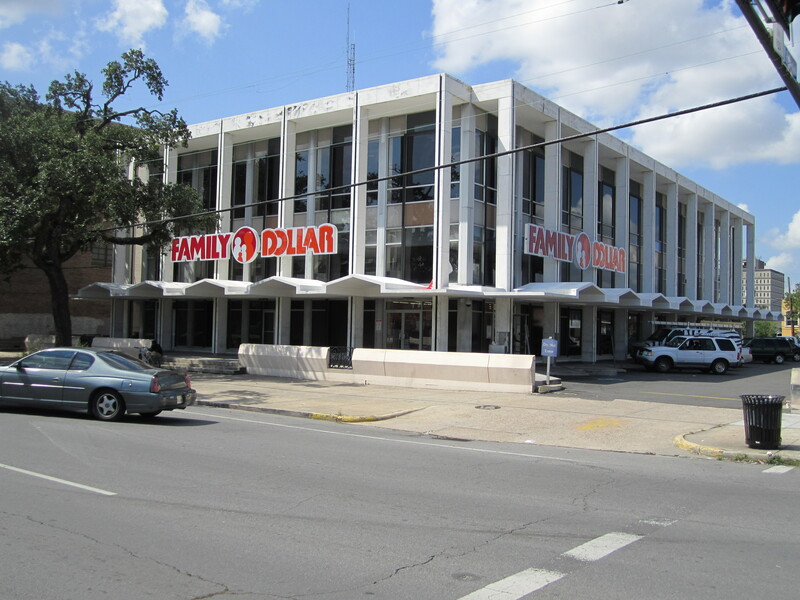 One of them which was a closed Whitney Bank branch, now two years later shows a resourceful reuse. There were other modern architectural pieces in the area not so lucky. 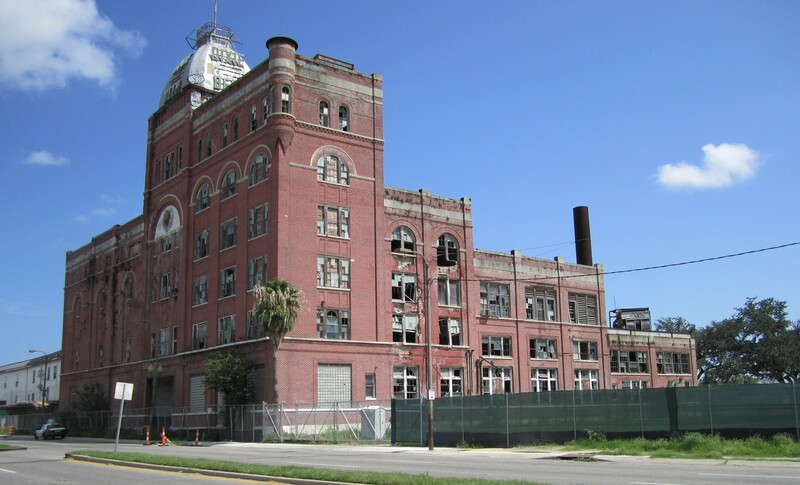 The Dixie Brewery suffers a similiar fate. Too bad about the oak trees. They are really so beautiful. They remind me of Savannah. Hope you and Tutti had a great time. Thanks for the comments, I just saw them. N.O. is so much BIGGER than Savannah; N.O. 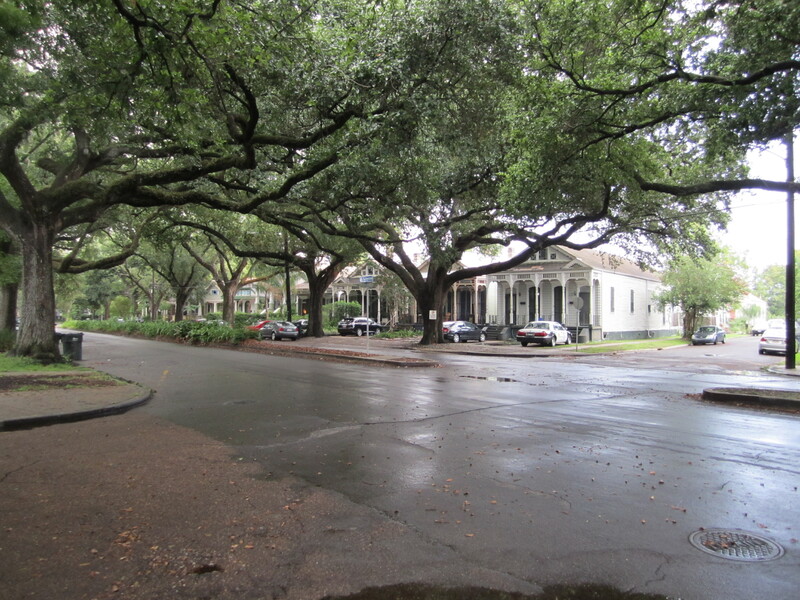 just goes on and on; from Bywater to Carrolton is about seven miles of solid nineteenth century or earlier houses, mostly surrounded by live oaks. It is a paradise, in one sort of way. We need to go there together the four of us. It is really far away, that is a problem.